The stones in Laura Jackson's earrings have a mystical beauty. An ancient legend says the Peruvian opal is powerful enough to release its wearer's stress and improve their confidence. We're not experts on Inca folklore but one thing is for sure: The stones in Laura Jackson's jewelry have a mystical beauty. 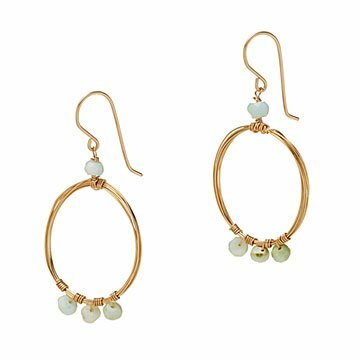 Starting with pebble-sized Peruvian opals, Laura hand-strings the beads onto shimmering 14k gold fill hoops for an artful addition to your look. Handmade in Pennsylvania. Make it a set! Click here to see the matching Peruvian Opal Hoop Necklace and Peruvian Opal Hoop Ring . I got the whole set, plus a diffuser bracelet with similarly colored stones for my wife. I surprised her with one piece at Christmas, one at our anniversary in January, and one for Valentine's Day. They are pretty, delicate, and unique. There was some disappointment in that the stones in the necklace were all the same shade - a very definite aqua. The stones varied more in the ring and earrings with some grey, mint and more muted aqua tones. My wife prefers the more natural and varied look of the ring and earrings. The necklace does not look like it matches the set since the stones are all one color and such a different shade.